In a C.S.A. the shareholder, or the consumer, shares in the risks of the farmer and has the opportunity to directly take part in the production of their own food. Shareholders proactively purchase the produce before it is even growing, helping the farmer pay for many of the costs involved in food production. The farmer therefore invests the cost back into the farm. In return, shareholders gain access to the freshest, most nutritious produce available. This direct producer to consumer relationship is more popular in today’s industrialized food system. We enjoy and find it extremely important to grow food for our local communities, neighborhoods, restaurants, and hopefully you! Our Produce is competitively priced with naturally grown local produce you might find elsewhere. With our produce you know who grew it, how it was grown, and where it came from. All funds, again, are put back into maintaining our farms operations. C.S.A. is not about cheap food; which is usually neither nourishing nor grown with care for the environment in mind. C.S.A. is about each of us eating fresh for our health and for the health of our planet. Customers in the program during 2018 saved about $265 compared to purchasing the same amount of products from us at our booth at the Amarillo Community Market. The contents of your box depend on the season and the elements. 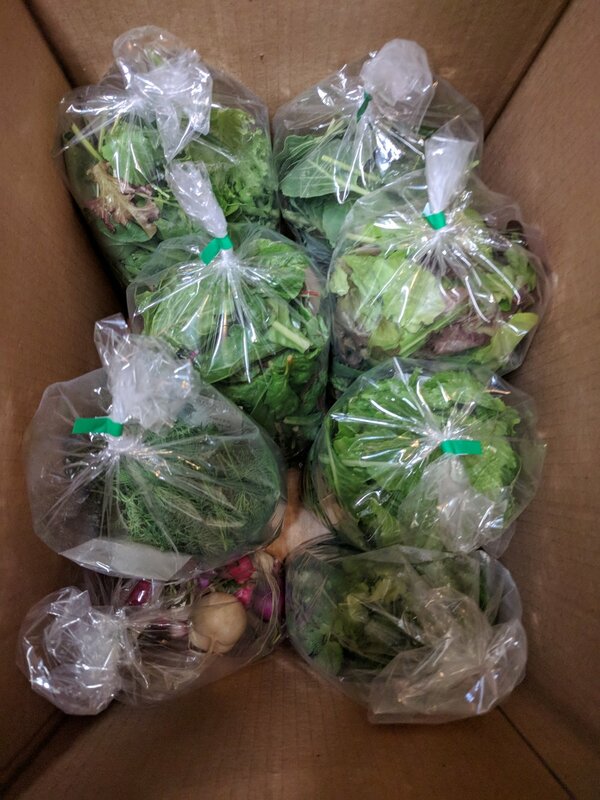 As available, your box will have our Gourmet Salad Mix, Spring Mix, Mustard Greens, Swiss Chard, and Collard Greens, along with radishes and carrots. We will also include some herbs in your box like Cilantro, Dill, and Basil. As spring progresses into summer and fall, we will have patty pan squash, cherry tomatoes, and cucumbers. For the most part, you will receive the same things every week. We also have plans to begin farming a new plot during 2019 at the Vineyards of Amarillo, which is much larger than what we are currently growing on. This will allow us to add more crops that we are currently not growing, for example, onions, potatoes, fruits. We are still in the planning stages so we will announce what we will be growing as soon as possible. Check out our Menu page to see pictures and links to possible recipes. Just like any farming enterprise, there are some risks. The most prominent risks we have in Amarillo for growing produce is drought/heat, weather, and insects. We do our best to mitigate as much risk for you as possible. During the hotter months of the year, we adjust our watering schedule and use shade cloth on the crops that can be easily damaged by heat. Hail is an issue for us here but we will do our best to keep crops covered during inclement weather to protect them from hail and damaging winds. Insects can be a real pest, but we will use insect netting and DE (diatomaceous earth) to reduce insect pressure. We cannot foresee all risks but when things happen to crops that we can't control, we will add extra amounts of available produce to ensure you have plenty of delicious veggies in your box. How long will the 2019 CSA run? This year we will run for 25 weeks beginning the last week in April until October. You will receive farm fresh produce direct from the farm. They are fresher and tastier. Also, they will not be in transit for 3-5 days so most of the nutrients will be intact when you receive the produce. You will be able to get your fresh vegetables consistently through the entire season. We will have 2 options again this year. A full share where you will receive 25 boxes of produce every week and a half share where you will receive 13 boxes of produce every other week. The total cost of the full share is $625 and the total cost of the half share is $400. We know that is alot to put down up front so we will have two payment options. You will be able to purchase a share either by paying for it in full with a $50 discount or by placing a $75 deposit to hold your share and then $25 for each weekly/biweekly box until you reach the total cost of your share. How will I get my box of produce? This year we will have multiple pickup options. We will be setup at Square Mile Farm Saturday afternoons from 3 to 5 with your box ready to be picked up. The address is 3908 SW 6th, Amarillo, TX 79106. You will also be able to pick up your box at our new location in the Vineyards Of Amarillo. The address for that location and the times we will make pickups available will be announced as soon as we the details of that plot ironed out. If you are unable to pickup your box, we will deliver to your house, Sunday afternoons starting at 2 for a small fee. We have closed sign-up for the 2019 Season. Follow us on social media to see updates during this season. You can also get our produce at the Amarillo Community Market, which starts June 9th. If you have any questions, feel free to email us at danny@nuke-cityveg.com.